The Aye-aye (Daubentonia madagascariensis) is a rare lemur that is native to Madagascar. They are the world’s largest nocturnal primate that is characterized by its slightly bizarre characteristics, which include rodent-like teeth that grow perpetually, and a special middle finger that is long, thin and almost skeletal in appearance. They are also known for their highly unusual feeding ritual called ‘percussive foraging‘. The aye-aye will tap on trees to locate grubs, and then chew a hole into the wood, using its incisors that are slanted forward. Once a small hole has been gnawed into the tree, it will insert its long middle finger and pull grubs out. Aye-aye are found primarily in rainforests or deciduous forest land, although some have adapted to live in cultivated regions that resulted from deforestation. They spend the majority of their life high up in trees, close to the canopy. Aye-ayes generally start life silver, with a stripe on their back. Their color changes as they mature, and they turn a very dark brown or black, with silver and white tips and patches of fur. 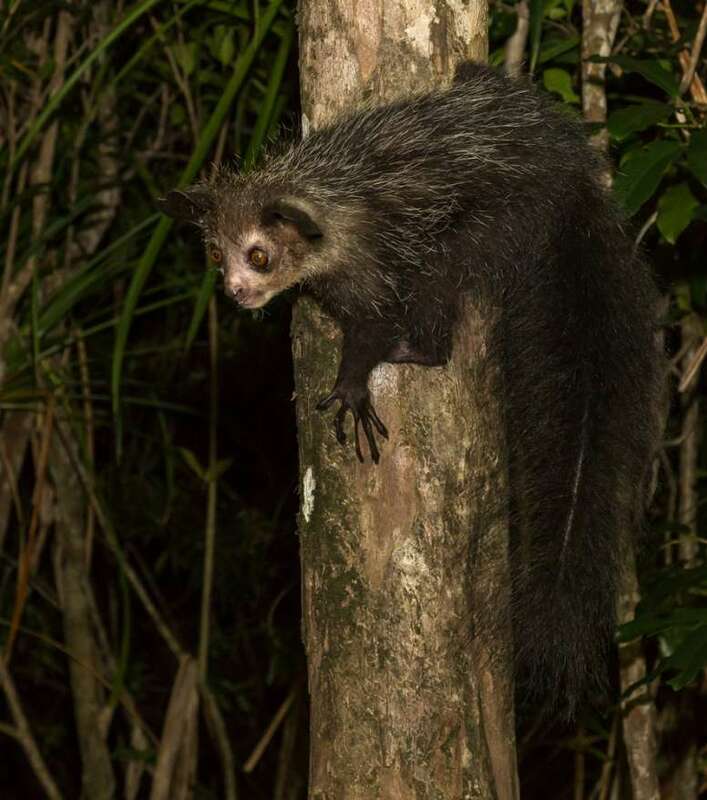 A fully grown, adult aye-aye typically measures around 3-feet in length, while its tail is bushy and as long as its body. The diet of the aye-aye suggests that it is an omnivore, as it eats much more than just grubs. They will also eat fruit, seeds, nectar and fungi. The aye-aye is currently classified as endangered, due to habitat loss of their forests and because locals consider them as ‘evil’ and often kill them if they come across them. A second species, Daubentonia robusta, became extinct sometime in the last century. 1. The Aye-aye is one of only two animal species that hunts for food using ‘percussive foraging’ – the method of tapping and making a hole in a tree to find prey. This is also used by the woodpecker, which penetrates the wood of a tree by banging it repeatedly with its beak and then extracts invertebrates. 2. They have a bizarre, long and multi-purpose middle finger that’s used for tapping wood, & foraging grubs. The third finger on each hand of the Aye-aye is thinner than the rest of them as they are used for tapping and digging while foraging for food. The middle finger also has a ball and socket joint, which allows it complete 360 degree movement, to enable it to reach into little holes and pull out grubs. 3. The Aye-aye is the only primate to use echolocation to find its prey. 4. The Aye-aye has eluded proper classification since it was first discovered. The reason for this is that not only does the Aye-aye have incisors – front teeth – that continually grow, which is very similar to rodents, it also has squirrel-like characteristics such as the toes, hair coloring and tail. 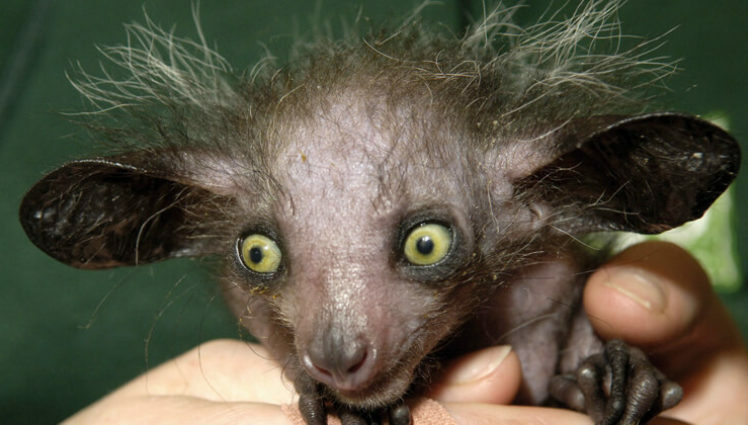 To make matters even more confusing, the Aye-aye has a head shape, eyes, ears and nostrils that resemble felines. However, it’s enlarged brain, long life and grasping hands and feet have supported it’s classification in the order of primates, and lemur family. 5. Aye-ayes have unusual coloring that changes as they age. When young, the Aye-aye has a silver front and stripe down the back. When they reach maturity, the body is completely covered in a thick fur, but not one of a single color. .
Photo credit to Bristol Zoo. 6. The Aye-aye is not just nocturnal, but it is also arboreal. This means that it generally spends most of its life in the trees. While they do find their way down to the ground every so often, they will eat, sleep, travel and mate in the trees. They prefer to spend time near the canopy where there is much more cover. 7. Aye-ayes nest in trees. During the day, Aye-aye’s sleep. They have spherical nests that are located in the forks of trees and are made out of branches, vines and leaves. 8. The Aye-aye has a territory and is generally considered a solitary animal. The Aye-Aye male has a personal territory that it will mark with a scent. The home ranges (or territories) of males can overlap and males can be somewhat social with each other. The female territories never overlap although a male territory can overlap that of more than one female. The male’s territory can extend to 80 acres in size while the female territory is not much more than 20 acres. 9. Aye-ayes have a system when it comes to digging out food. The Aye-aye will start foraging between 30-minutes and 3-hours after sunset with roughly 80-percent of the night spent digging out grubs from trees in the canopy. They will take the odd rest period. The Aye-aye climbs trees using vertical leaps in the same basic manner that squirrels do. They find moving horizontally far more difficult and they do not normally go down in order to climb another tree. An average night will see an Aye-Aye cover up to 4-kilometres during a foraging session. 10. 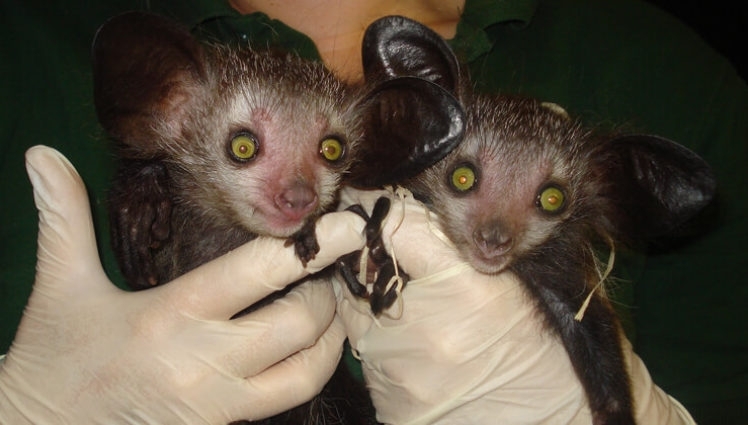 Female Aye-aye’s are dominant to males. They are not known to be monogamous, either. In fact, it is not uncommon for females to challenge one another for a mate. When mating, the male is typically locked to the female and mating sessions can last up to an hour. Aside from mating, males and females may interact when foraging. 11. Aye-ayes are believed to be bad omens by their native residents. Legend has it that the Aye-aye is a bad omen. If an Aye-aye is caught by someone who sees them as evil, the animal is killed on sight and hung so that the evil spirits can be carried off by travelers. Others believe that if an Aye-aye points its middle finger at you, you have been marked for death. If an Aye-Aye appears in a village, it typically means that someone in that village is going to die and the only way to prevent that from happening is to kill the Aye-aye. 12. The Aye-aye was thought to be extinct in 1933. 13. The IUCN classify the Aye-aye as endangered, but their conservation has been aided by captive breeding programs. 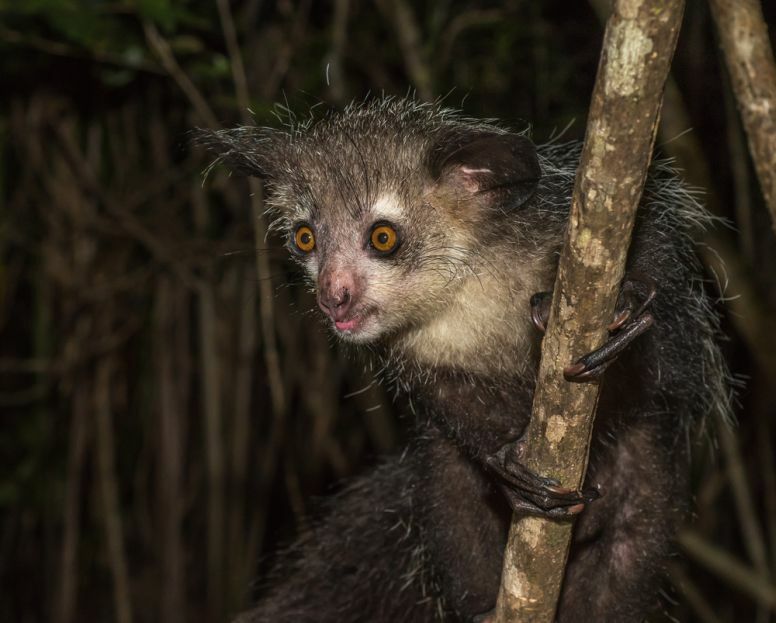 “Percussive foraging in the aye-aye, Daubentonia madagascariensis”, via Science Direct. “Aye-aye”, via IUCN Red List.